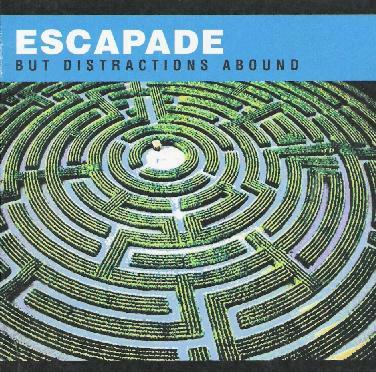 Escapade - "But Distractions Abound"
But Distractions Abound is the first new full length album from New York City based avant-space rockers Escapade since 2002's Rule #3. They did a split CD with Acid Mother's Temple the following year (see AI #26), and last year's If/Or was an archival release of the band's first ever performance from 1996 (see AI #31). Throughout the album we're in deep space, with lots of krautrock influences and are continually reminded why Escapade describe themselves as "avant-space rock". "Partial Memory Occurrence" opens the set with steady but relentlessly pounding drumming at the forefront, accompanied by screeching acid guitars and atmospherics. The rhythmic pulse shifts a few times, with the drumming really guiding the direction of the music. "Coldth" is a spaced out, droning, krautrock-ish jam, with a great combination of searing acidic licks, ghostly, howling atmospherics and a strangely song-like melodic feel. Circle fans would love this. Escapade are similar in that they lay down repetitive rhythmic patterns that form the basis for high energy, darkly spacey jams, that draw on a number of influences, but are ultimately, and very uniquely, occupying their own place on the space/psych/kraut axis. The 13+ minute "As Far As" is the longest track on the album and includes some of the most purely psychedelic music I've ever heard from Escapade (though of course there's nothing normal or standard about it). Acoustic bluesy guitar combines with sitar for a raga jam that gets increasingly trippy as the music progresses. The stringed instruments jam along in their little world while the bass and drums pound away to give the music a power rocking but completely off-kilter and ever shifting rhythmic base. After several minutes things transition a bit with the sitar (that's what it sounds like anyway) going into drone mode, and the band take off into another direction where an eerie ambience seems to take over. It's a totally trippy, experimental psychedelic world that's like a cross between Faust and John Fahey. An outstanding and excitingly varied track and my favorite of the set. "Mistitled" is next and features dark, droning space rock with ripping guitars that remind me of the first Farflung album, though it later launches into a jam that sounds like a spaced out, acid drenched Guru Guru with Zappa on guitar. Wow! "Memley Mem" is a very cool avant-psychedelic trip with whining space guitars and sitar and a generally experimental yet highly lysergic vibe. And "Adhere" is a blazing psychedelic, yet punk-ish, krautrock jam that brings the album to a powerful close. No soft landing here kiddies. In summary, Escapade are among the most truly progressive bands in the space rock world, always introducing a grab bag of influences and creating some of the freshest and most exciting music the genre has to offer. Long time fans will be bowled over by this album and the uninitiated should consider this an ideal place to start. At the time of writing But Distractions Abound was not yet released. But keep your eyes peeled to the Escapade web site at: http://motherwest.com/escapade.